The small heart is cut from a banana slice. It isn't sinking (note the strawberry heart). 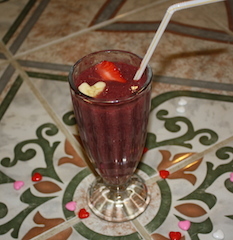 I wanted to have a very colorful sweet smoothie for valentine day so I bought colorful fruit. 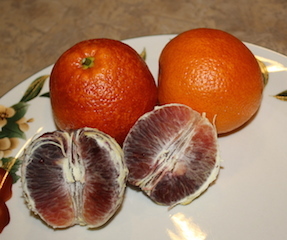 I had never had blood oranges before so I thought I would try those. I tasted one when I brought it home. It tasted good and was so colorful. Blood oranges are nutritious. 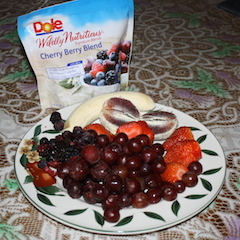 They contain vitamin C, calcium and phosphorus. 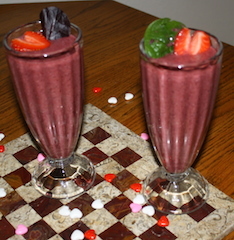 The dark red gives your smoothie color, and the blood orange supplies antioxidants that the body needs to stay healthy. Blood oranges contain folate which aids in development of red blood cells, and helps support your immune system. 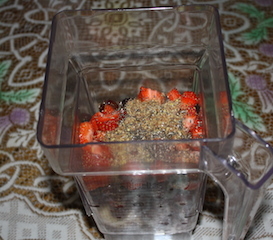 Put all ingredients into the blender container and blend to desired consistency. Enough for 2 generous smoothies. You may add a spoonful of pure maple syrup if it is not sweet enough. Mine was so sweet that I only added above ingredients. If you cut your garnish thin, it won't sink into the drink. What special treat do you serve on Valentine's Day. Put your comments and/or recipe and pictures below.